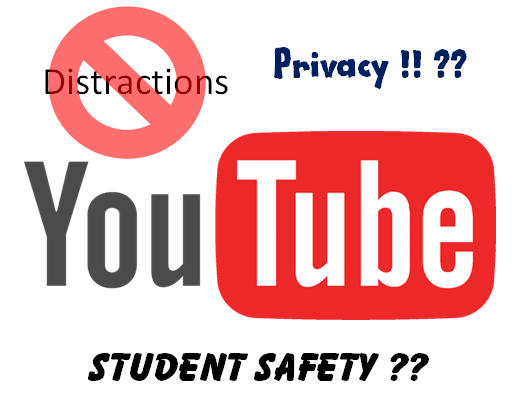 Do you want to be able to use YouTube in your class, but are concerned about exposing students to the distractions that surround it? Worse yet, inappropriate content may be displayed, which is a huge concern for younger students in particular. Well I am here to provide a few approaches to solving that problem. You can use YouTube to host and deliver videos safely, without the distractions. Concerns about this come up whenever I teach Flipped Class techniques. Using YouTube to deliver content is easy and helps to ensure that students will be able to watch the content. But it's easy for them to get distracted or to be exposed to the wrong kinds of content, unless you take a little extra precaution (and know how to). Another consideration that is also often voiced is privacy. If you've created the content yourself, or if content is created by or features students, you may want or need to be able to deliver content in a way that is not publicly accessible. The following tools and techniques offer a mix of privacy and safe delivery approaches that should help you meet your needs. One approach to providing some level of privacy and limiting distractions is to deliver a YouTube video in a private tool like an LMS or other member-based environment where you can embed YouTube code (if you aren't sure how to use embed code, this video will help). If you set your video to “Unlisted” when you upload it, no one will be able to find it through searches, and it won't display on your channel or playlists (the only way anyone can access it is if they have the URL). If you then use the embed code to deliver the video in a separate, private site, only those who have access to that site will see it and they will only see the video and none of the ‘visual clutter' that typically surrounds YouTube videos. Unfortunately, there are are still a couple downsides to this approach. It is not 100% private, since viewers could click on the video link at the top of the embedded video and this will open it in YouTube, where they could then copy the link and send it to someone else. It is also not 100% distraction-free, because at the end of the video, a bunch of related videos will be displayed in a tiled format (I wish Google/YouTube offered an option to turn that off for selected videos). An alternative that solves one of the limitations of the above approach is SafeShare (safeshare.tv). SafeShare lets you deliver any YouTube video with zero distractions – there are no suggested videos at the end. It is super easy to use … you just paste in a YouTube video URL and click on “Generate Safe Link” and you get a SafeShare URL where it can be watched with no distractions (here is an example of a video delivered using SafeShare: http://safeshare.tv/w/rUfRCaMGwK). Note that you cannot see or access the original video URL. However, you have to provide the SafeShare URL, which can obviously be shared, and you can't embed SafeShare content, so the privacy issue isn't really addressed through this tool. However, there are a couple other cool things it let's you do though that are worth knowing about. Crop Videos is a couple clicks! Another cool feature of SafeShare is that it let's you easily crop videos before you deliver them. You can cut off as much of the beginning and/or end of a video as you want, and what remains is all students will see. It's easy to use … after you paste in a URL and click “Generate Safe Link”, use the Customize Video function, then click on “Full” (next to “Play Length”) it you will get an interface where you can play some of the video and click to tell it where you want to to start, and then also tell it where to. Download: SafeShare also lets viewers download videos as either mp3 or mp4 files, which can be very useful, but it's important to comply with copyright laws. I wish they would allow this function to be turned off (like they do for the social media ‘share' function). Notice that not only are there no distractions, and you also can't find or share the original video URL or the TubeChop URL! So if you deliver this in a private tool like an LMS, Edmodo, a members-only Wiki or Website, etc., it is truly private. Awesome. I would note that TubeChop is really best when it can be embedded, since if you just share the TubeChop URL for the edited video (example here), the delivery is still a bit cluttered, and not private. YouTube for schools shouldn't be confused with YouTube EDU or YouTube.com/teachers, which are separate functions. Click here (and then click on the second item in the list) for clarification. I should also add that Google is constantly tweaking the layout of YouTube and a zillion other things about it, so this guidance may become obsolete pretty quickly. One last option that looks interesting is QuietTube. QuietTube is an add-on that provides a button you can use to easily create a custom QuietTube URL for any YouTube video, which then let's it be played without distractions. Unfortunately, dragging and dropping the button that provides the functionality didn't work for me in Moodle or IE. The tutorial video they provide on the home page shows them using Chrome, so maybe it only works in Chrome. Which Option is Best for You and Your Students? The answer to this question really depends on your specific circumstances and your needs. If you aren't concerned about privacy, all of these tools can result in reduced or eliminated distractions (SafeShare and TubeChop are great for that). If you are a Google Education customer already, it is presumably worth exploring YouTube for Schools. Lastly, if privacy is a concern and you have the ability to embed content in a private content delivery vehicle for your students, TubeChop is probably perfect. I hope you will drop a comment and let us know how you make out with these tools if you try them, or tell us about alternatives you may know about. This is an important and challenging issue for many educators, so your feedback is sought after and welcomed! Do Video Lessons Reinforce Learning, or Just Reinforce Pre-existing (Incorrect) Understanding? SafeShare is illegal if you are using it to download any video from YouTube which is not in the public domain (which constitutes the large majority of YouTube videos). I am beginning to take notice and am potentially taking legal action against those who are stripping our video off of YouTube and using it on safeshare.tv. Please be aware SafeShare is NOT the same as a site like viewpure, or other site which removes distractions (but not ads), because it strips the video from YouTube and and illegally records it on it’s own platform. We are currently working with YouTube to try and rectify this situation. If you are currently using SafeShare.Tv, and you are willfully violating copyright rule, you may face statutory penalties and/or criminal charges. There is a service that enables you to embed your private YouTube videos on your website. Check it out at Embed Private YouTube Video (http://embedprivatevideo.com/). They also released a WordPress plugin. This way only your website members will be able to watch them but they will not be able to share them. Interesting question JJS. Safeshare addresses this on their FAQ page: https://safeshare.tv/faq (see Q re: Is Safeshare Legal?). I don’t really think sites like this would be violating copyright, as the content is being embedded and delivered quite similarly to the way YouTube already allows their users to do. What is being limited is the distracting ads, etc. I have to imagine if Google (who owns YouTube) had an issue with sites like Safeshare.tv, they would take action. I teach at a preschool where we have lots of great educational youtube videos converted to safeshare so the ad is not present when little children are watching. Our administrates concern is that this may not be legal due to copyrights for youtube. How can I verify this? Our teachers love the converted youtube videos and would hate for administrative to take it away from them. Any suggestions? THanks! Thanks Doug – I’ll have to give that a shot! Now you can embed private YouTube video on your WordPress website and share it only to your website users. Take a look at this tutorial – http://embedprivatevideo.com/how-to-embed-private-youtube-video-on-a-wordpress-website/ . I use the site http://youtubeconverter.me/ to quickly convert youtube to mp3. I’m using http://safeyoutube.net, it’s the best so far. Another one that works similarly to viewpure is called watchkin.com. The things I like about it are that it has a browser add-on to automatically send you there whenever you go to a youtube video page, and it filters out the search results to be more family friendly. Thanks for sharing ViewPure Nancy! Great ideas. I have never heard of Tubechop. I am going to check that out. Have you heard of http://viewpure.com/ It is similar to Safeshare but I like it better. It has some customizable features. Thanks Marie-France – Good point. I’m a fan of EduCanon too (made this 3 Minute Teaching With Tech Tutorial about it: https://www.youtube.com/watch?v=uoOrjHHlDks&list=UUukA5e8HbMMpgfm3_DaoscA). I did not consider it from the perspective of privacy and limited distractions though. I need to do so! I use eduCanon and for me it’s an easily integrated solution for making interactive videos. With eduCanon, I can enrich my videos with questions and digital content… and I can see the progress of my students. It’s LMS integration – security and no distraction.